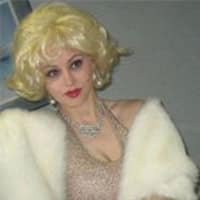 Her interpersonal skills include a charismatic,approachable and positive ” Madonna” persona that interactively delights guests from all ages and social backgrounds. Having years of international travel experience, She is an excellent choice for multi-cultural events and upscale venues.Her extensive background in promotions, event planning and strategic marketing have given her diverse production skills which will render you a fine performance tailor-made for your event.ADDITIONALLY: She encourages you to offer any ideas you might have that she may expand upon to ensure that her appearance is conveyed in a way that will meet your expectations! Madonna impersonator, Madonna lookalike.